The other day I was rearranging my bookshelf to put the guidebooks all in one place, the narratives in another, and box up some that I use less frequently. The shelf is stacked from floor to ceiling inter-mixed with an old piton, an old belay device, broken altimeter, thank-you cards from Banff, and the knife from my Uncle Tom. 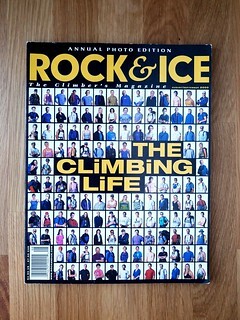 I came across my oldest set of climbing magazines from the early 2000s and two books from the early 1990s. They affected me how they always affect me; a flood of forgotten feelings, including an impulse drop everything to go to the Adirondack Mountains, came over me like a wave. Later that week, I realized that I wouldn’t be who I am today without the experiences those climbing magazines and books gave me. 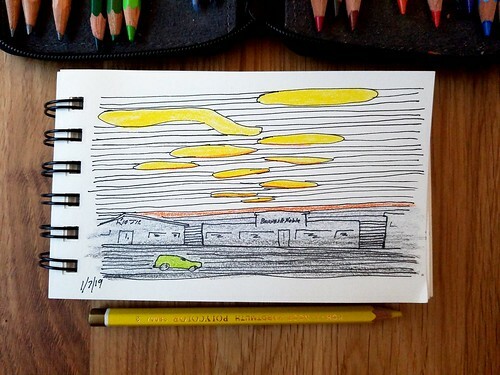 It wouldn’t have happened without the arrival of a new bookstore in town. Although I have been told I watched a lot of television when I was a kid, what I remember most about growing up in my home was my mother, father, and siblings reading. They read the Bible, The Buffalo Evening News (when it was still delivered daily around five p.m.), magazines, Reader’s Digest, books from the library and the bookstore at the mall. I remember reading The Young Astronauts series and how it ; my imagination was strong and while I muddled through the school day, I could always come home to read and then go out into the six-acre woods behind my home to play out exploring the Martian surface. Outside the enchantment around my house, everything seemed lackluster. Everything except for the high peaks of the Adirondack Mountains, a six-hour drive away that until college, we only made the trip for a week once a year. The breeze on a bald summit, the edge of a flat-water lake, the silence on a trail surrounded by mossy boulders and evergreens, and the remote rock faces were beyond the scope of my imagination. I was awed by it all. One week in the ‘Dacks filled my cup for a whole year. Around 1998, the sleazy bookshop at the mall was unseated as the great local bookstore. That’s when a Barnes & Noble opened up in my neighborhood of Buffalo, NY. The one at the mall was the place anyone at the mall seemed to hang out who didn’t have money to spend but needed somewhere to go. The loiterers endlessly perusing magazines and trinkets; they rarely entering the two long narrow aisles of books. I visited the American history section mostly, seeking interesting stories of people rising up to do important things. 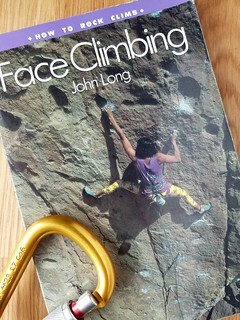 Until the arrival of Buffalo’s Barnes & Noble, the only climbing book I owned was John Long’s How to Rock Climb: Face Climbing (1992), which I bought at the Eastern Mountain Sports in Lake Placid. I had stumbled, without knowing it, into bouldering on mossy Adirondack glacial “pebbles” the size of pickups and box trucks strewn through the Adirondack High Peaks. No one was there to teach me so I hoped this book would unlock some secrets. It did, by teaching me different foot positions and even introduced me to the technique and joy of slab climbing, which is abundant in the Adirondacks. 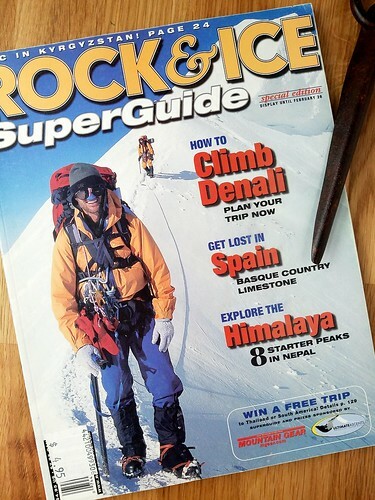 I suddenly had access to publications, like the American Alpine Journal that demonstrated what a serious and detailed group many climbers were, Climbing Magazine, which taught me skills, and Rock & Ice, which had fascinating features about people that appeared to have surrendered themselves over to climbing. I peruse these issues every few years, often when packing or unpacking for a move, like when we went from Alexandria, VA to Lancaster, PA. I still get this urge and sense of suddenly being unsettled, and feel the need to load my backpack with my helmet, put on my boots and drive to the Adirondacks or White Mountains in the dead of night to be there by morning and hit a trail to a peak or a hidden (always hidden) crag. I also discovered David Roberts’ books in that bookstore. 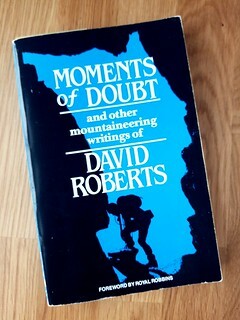 I bought a copy of Moments of Doubt, a collection of his articles. I have two memories strongly associated with finding this book. First, I was laying in bed before going to sleep reading the essay “Five Days on Mount Huntington.” In the introduction to the article, Roberts wrote, “I have never lived through a five-day span or comparable intensity.” I read on, as if I were a silent partner traveling with Roberts and Ed Bernd on Mount Huntington, even after Bernd’s mysterious accident that left Roberts alone, high on the mountain, to endure days and nights of storm. My eyes widened, I held the book tightly, and I felt my mostly-dark bedroom was a tent on a snow-blown mountainside that was horrifyingly stormy. Bernd was certainly gone, but Roberts was also certainly aware and the wisdom of his experience was like a candle lit in my dim suburban neighborhood. The other memory is thinking that I had a treasure. The climbing genre books at 796.522 next to the baseball and hockey books were deep. It wasn’t about breaking sport franchise records, or the final scores, or even changing the world or important things like ending poverty. I have always been into religion and theology and the human experiences of climbers written by climbers were the closest things that I related to and connected with from my experiences in the Adirondacks. They were human, emotional, at times egotistical, often impossible to put into words, and yet more enlightened about life and being alive than I have ever read. I had found literature that wasn’t about insight into the every day, I found people that came from the every day and transcended the every day. They found the mountain high and the peace and clarity that comes from the heights. I felt it before, but I thought it was reserved for church and prayer time and maybe after my mountain vacations, and yet, I found it reading these books by people doing something… seeking something, though they rarely ever said what they were seeking. I connected with them. And I kept the treasure, the books, and my mountain climbing, a secret for a long, long time. It was too personal, too important, to share. Peakbagging, ice climbing, and bouldering gave me power; today I call it being centered. I didn’t share it, I think, because I thought that if I shared my love for climbing books and climbing that my secret power would be diminished. I had been bullied and picked in elementary school. In defense, I learned not to bring up things that would make me vulnerable. In Buffalo, I had a fire in me, but I felt like very few people supported keeping it lit and a few wanted me to put it out. I don’t know why, even as I turned 40. When I graduated college, I left for Washington, DC without a job, without a cell phone, a bag with three suits and several neckties, a laptop, my Bible, and a box of climbing books. By 2004, I was established in a job working for my hometown Congressman. One night while watching C-Span from the office, I was emailing the boss with recommendations on how he ought to vote on all of the procedural amendments to an appropriations bill. In between votes, during drawn-out remarks by other members of congress, I was exchanging messages with my former colleague who quit Capitol Hill gig to live and work in Alaska just a few months ago. Because of Moments of Doubt, and egged on by stories in those magazines, I decided I had to go, and now was the time to make a pilgrimage. That summer we saw Denali on the clearest day of the year, took in the Harding Ice Field, and even got thrown out of a bar in Anchorage. I look at the magazines in the stacks these days and compare it to how I feel looking at a new issue of Climbing or R&I and realize I don’t get that feeling. I don’t feel compelled to participate the same way. I suspect that it’s the level of responsibility I have accepted and embraced since then; I can’t simply pickup and nonchalantly go on some adventure with aplomb like I once did. While I remember the uncontrollable urge to go climb in the Adirondacks when I look at my old climbing magazines, I also know in the here and now I don’t feel it. I am somewhat content. (I say somewhat, because there are always improvements to be made in life, right?) The weird part is, while I am nostalgic, I don’t even feel like I am disappointed at my contentment. Perhaps because I like where I am. In fact, since Natalie and I had our little Wunderkind and Schnickelfritz I have gone on only short hikes but seen more if not just as much as I did on my 22-mile day treks high above sea level. Sometimes I miss the view and breeze atop the bald summits, yet the interest in the streams, a salamander, or a red fox, and bird watching has been truly magical. While wilderness might be far, nature is all around, and it is more rewarding than I ever realized before. Now, my hikes with my family and my frequent trips to the climbing at the gym are the things that both center my mind and keep me physically fit. I don’t know where I would be as a partner to Natalie and the kids without either of those activities. Natalie recently reread the biography of Maria Von Trapp, as in the Sound of Music, which we both read with joy before we had children. She recently reread it and read outloud some portions to me; it felt like we had overlooked entire sections and themes. I suppose our lenses have tinted since then. I think most literature, but particularly books, is the same way — dynamic. My climbing books can be elastic and strike me in different ways depending where my experience has taken me to open new doors and windows into what the author put on paper. Maybe it’s time I reread some of Moments of Doubt. Still, it’s not that way as much with magazines. In looking through that old stack of climbing magazines, I can still see clearly who I was and how much I have changed because of them.